This LP is the first vinyl pressing for two older Pinback CDEPs. Some Voices was originally released on Absolutely Kosher back in 2000 while Offcell was put out in 2003 by the same label. Stuck next to each other on wax, this ends up being a surprisingly cohesive album. 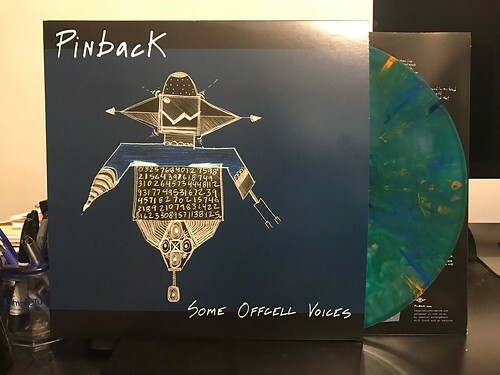 I will say this about the songs on this LP, if you've never really been into Pinback before, there likely isn't going to be anything on here that's going to change your opinion about the band. Luckily, I happen to adore this band and to me, Pinback never disappoint. While I do have all of Pinback's full length, I never went out and tracked down all of their various EPs, so a lot of these are brand new songs to my ears. As you might expect, they are full of the type of soaring vocals and staccato guitar plucking that I just love. If nothing else, it's a nice little slab of vinyl to keep me satiated until the next Pinback full length. I haven't heard too much about one of those; but I am hopeful it'll arrive sooner than later.